Clear statues to first tower (Dagourmarche's tower). Clear statues to the first Yagudo area, including time extension Avatar Icon 62. Move north up the ramp and kill Goblins west, including time extension Goblin Replica 102. Move north past the second tower (Quiebitiel's tower), clearing statues up to Goblin Replica 176. (Order optional) Clear statues to the Dynamis Statue. Clear statues towards the ramp leading east to the third tower (Goublefaupe's tower). (Order optional) Clear statues to the Dynamis Icon. Clear statues south, including time extension Adamantking Effigy 234. (Order optional) Clear statues to the Dynamis Effigy. Clear statues southwest, including time extension Adamantking Effigy 251. Proceed to statues located west of the fourth tower (Mildaunegeux's tower). Clear statues west, including time extension Serjeant Tombstone 302. Return northeast, towards the coast. Clear statues northeast, including time extension Serjeant Tombstone 316. (Order optional) Clear statues to the Dynamis Tombstone. (Optional by objective) Clear statues at the lake area. If objective is to clear Angra Mainyu, TP should be saved after defeating Goblin NMs. For farming runs, this area can be ignored. This strategy requires time sufficient enough to pull away Angra Mainyu's pets a significant distance away from Fei'Yin prior to fighting. Alliances stage in the southwest corner of the area in front of Fei'Yin. One player pulls Angra Mainyu with a NON-DAMAGING spell or ability. Aggroing Angra Mainyu will cause the NM Pukis dragons to spawn. Tanks will need to quickly pull their assigned Pukis away, leading them south up the ramp and generally back towards the start of the zone. Tanks should be prepared with Antidotes to survive Poison Breath (-50HP/3s) while kiting. Once the Pukis dragons are a large distance away from Fei'Yin, defeat Angra Mainyu. At regular intervals, Angra Mainyu will teleport around the area in front of Fei'Yin. In order to quickly track it, it is useful to have an avatar constantly attacking it. The avatar will automatically acquire Angra Mainyu's new location after it teleports. Every time Angra Mainyu teleports, hate on the Pukis dragons is lost as they will return to assist it. Tanks will need to consistently make sure their Pukis is following them once alliances have begin to fight Angra Mainu. Angra Mainyu will begin to use Chainspell and Death when its HP is low. Once Angra Mainyu has been killed, Pukis NMs will have a very large aggro range. It is possible to be detected long before a dragon can actually be seen. Defeating Angra Mainyu does not grant a time extension. Spawning the Attestation Hydra NMs is accomplished by killing the Vanguard Eye (479) in the tower furthest northwest in Dynamis-Beaucedine. This is easiest accomplished by taking a small, high-powered group (no more than one party, including support) through the Hydra area for the sole purpose of clearing nothing but the trigger Vanguard Eye. 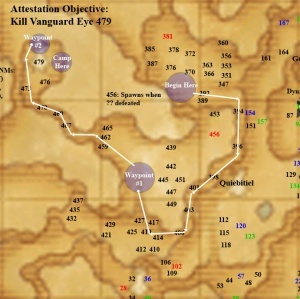 The generally recommended strategy involves training most of the Vanguard Eyes on the path, along with their Hydra, with two intentional wipes prior to arriving at the trigger Vanguard Eye. Alliances clear Vanguard Eye 347 on the ramp leading towards Xarcabard. (Optional) Alliances clear Vanguard Eyes 389 and 392. Train Vanguard Eyes along the white route, stopping at the ramp indicated by Waypoint #1. All members should have Flee (through a job ability or use of an item), and use Poison/Venom Potions to avoid being slept along the way. In addition, all members should have Reraise to be able to continue to progress, in the event something goes wrong. Stop at Waypoint #1 and die. Once medication and Weakness effects have worn off, repeat the process to the area marked as Waypoint #2. Once Weakness wears off, camp east of the tower. 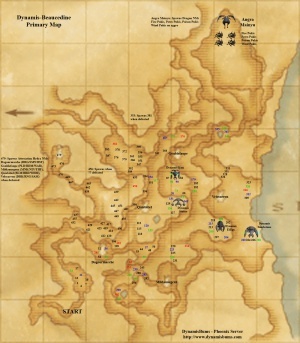 One player will need to aggro the Vanguard Eye by proximity and drag the spawning Hydra south. The hourglass can be dropped after pulling the Hydra out of the tower to prevent being KO'd and stranded in the area. Another player must be close enough in range to pull the Vanguard Eye out of the link and bring it back to the remaining group to be killed without initially aggroing the Hydra spawned by the Vanguard Eye. Note: There is a delay between the initial spawn and time Hydra enemies acquire their targets. Once the Vanguard Eye is killed, the Attestation NMs will spawn in their towers, and players can Warp/Teleport or drop their hourglasses and reenter Dynamis to rejoin the other alliances. All Vanguard pets (Crows, Hecteyes, Scorpions, Slimes) including Hydras' Hounds (casts Blindga) appear in this zone. Keep them away from the main alliances and consistently slept/lullabied and silenced. Vanguard Eyes have substantially greater HP than their counterparts in Dynamis-Xarcabard (~200-300%). They cannot be easily killed by the minimum number of BLMs required for the same task in Dynamis-Xarcabard. Time extension Vanguard Eye 381 must be first spawned by defeating Vanguard Eye 353. Time extension Vanguard Eye 456 must be first spawned by defeating Vanguard Eyes 432, 435, and 457. Attestation NMs can be easily be pulled from their accompanying Hydra through a sacrifice pull. Proper positioning may be necessary for NMs that can move at a faster rate of speed (Goublefaupe). It may also be necessary to assign several players to pull additional pets when fighting Dagourmarche. This page was last edited on 13 August 2017, at 22:34.